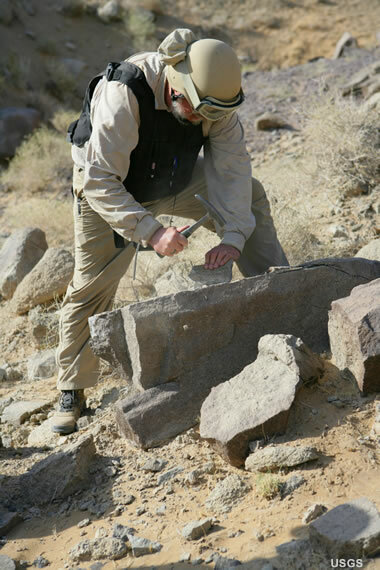 A geologist collecting rock samples in Afghanistan as part of a mineral resource assessment. Between 2005 and 2007, geologists from the United States Geological Survey worked with the Afghanistan Geological Survey in an assessment of known and as-yet-undiscovered mineral resources. The assessment revealed that Afghanistan has abundant non-fuel mineral resources that include: copper, iron, barite, sulfur, talc, chromium, magnesium, salt, mica, marble, rubies, emeralds, lapis lazuli, asbestos, nickel, mercury, gold and silver, lead, zinc, fluorspar, bauxite, beryllium, and lithium. More information about the USGS work in Afghanistan can be found in the "Sample Work Products of Exploration Geologists" box below. Photo by the United States Geological Survey. What Do Exploration Geologists Do? Exploration geologists are involved in the search for rock and mineral deposits of economic value. Their goal is to find minable occurrences of metallic ores, gems, pigments, industrial minerals, construction materials, or other minable commodities. They often work for mining companies looking for new deposits to mine, or they assist in the planning and expansion of existing mines. Some are employed by small companies who hope to find valuable mineral properties that can claimed, leased, or optioned -- and then sold or converted into an equity interest in a mining operation. Others work as consultants to mining companies, government agencies, or financial institutions. Thousands of exploration geologists are employed in the United States. This page is about those who look for rocks and minerals of economic value. A special category of exploration geologists are involved in the search for oil and natural gas. They are known as petroleum geologists. Core Sample Warehouse: Companies and government agencies spend billions of dollars every year drilling holes to learn about the composition and physical properties of the rocks below. Many of these holes are drilled with equipment that recovers cylindrical samples of the rocks from the subsurface. After these are examined, measured, described, and photographed, many of them are placed in boxes or tubes and stored in warehouses for future reference. The investment to acquire these subsurface samples is so great and the information so valuable, that storing them for future reference frequently makes sense. 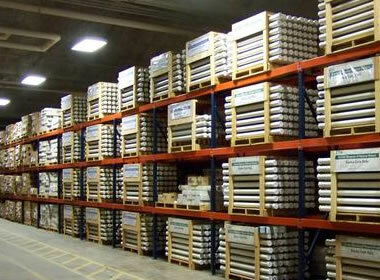 Photo taken at the United States Geological Core Research Center warehouse near Denver, Colorado. The job often requires extended travel to work sites where the exploration geologist will work and sometimes live outdoors in any climate or weather. It can require long days of hiking while carrying heavy equipment and rock samples, or long days of work at drilling or sampling sites. Heavy physical work that includes lifting, digging, handling core specimens, or operating equipment is often required. Much geological exploration is done in rural areas, forests, jungles, deserts, or Arctic areas. Work might also be performed at a drilling site, an open pit mine, an underground mine, or a mineral processing plant. Much of the work done by exploration geologists occurs in offices and laboratories. Some exploration geologists spend most or even all of their time in these settings. These exploration geologists might look for minerals using photographs, enhanced images or data collected by satellites or low-flying aircraft. The satellites and aircraft can carry sensors that record gravity, geomagnetic, spectral and other types of information about the land below. The exploration geologist might use computer software to process and map the data collected. Some exploration geologists do chemical, mineralogical or microscopic examinations of rocks collected in the field. They work to identify valuable minerals or indicators of mineralization and map that their distribution across a georgraphic area - or even in the subsurface. They do tests to determine if the minerals can be extracted from the rocks in which they are contained at a cost that will result in a profit. These are just a few of the many types of work that exploration geologists do in offices and laboratories. Rocks Through a Microscope: Rocks collected in the field by the exploration geologist are often brought back to a lab for chemical, mineralogical and microscopic examination. Above is a cross-polarized light photomicrograph of minerals in drill core samples from the Local Boy deposit, Duluth Complex, Minnesota. Photos and descriptions made during the microscopic examination are used to document what was found. 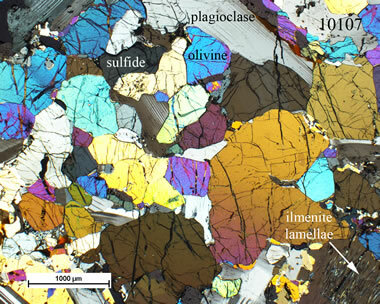 Photomicrographs are annotated with drill core number, scale, and mineral grain identities. Photo by Ruth Schulte of the United States Geological Survey. The work of an exploration geologist often requires an extensive knowledge of mineralogy, petrology, economic geology, geological processes, soil science, chemistry, hydrology, field mapping, mineral rights law, and other subjects. Some projects utilize data that is acquired by satellites, aircraft, ground-based surveys, or down-well tools. Exploration geologists must be able to communicate the results of their work clearly and make a permanent record of their findings that others will use. The ability to communicate clearly, both orally and in writing, is essential. If your findings are not organized and permanently recorded they can be lost to the company or organization that paid for them. The minimum qualification for working as an exploration geologist is a bachelor’s degree in geology from an accredited university. The preferred education is usually an advanced degree in geology with a specialization in mineralogy, petrology, or economic geology. A licence to practice geology is required in some states and countries. USGS Projects in Afghanistan: An entire website that summarizes work done by the United States Geological Survey in cooperation with the Afghanistan Geological Survey; part of the United States Geological Survey’s website, accessed December 2018. Summaries of Important Areas for Mineral Investment and Production Opportunities of Nonfuel Minerals in Afghanistan: by Stephen G. Peters, Trude V.V. King, Thomas J. Mack, and Michael P. Chornack; United States Geological Survey Open-File Report 2011–1204, 1,810 pages. The products of an exploration geologist’s work might include geologic maps, mineral resource maps, mining plans, databases of chemical and mineralogical analyses, and mineral resource assessment reports. Boxes of core and boxes of rock specimens are often archived in a “geological sample library” for future reference. The work is often progressive, starting with an assessment of a broad geographic area, then focusing on areas of highest potential with drilling, coring and sampling programs.